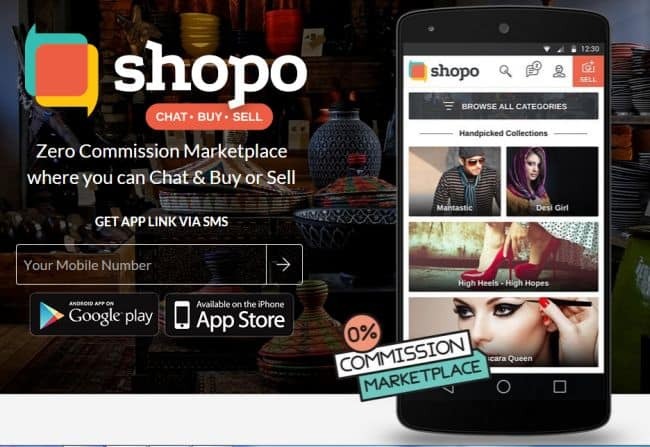 Snapdeal on Wednesday launched Shopo, a zero commissions marketplace app, where buying and selling products is routed through a chat interface. Snapdeal had acquired Shopo in 2013. Snapdeal has taken a step away from its online marketplace model to tap into India’s booming Small and Medium Business (SME) segment with Shopo. Currently out of 32 million Indian SMEs, less than 0.1% sells online. The company is expecting the platform to host 1 million shops online in next year. Shopo allows anyone to open a shop online, chat with prospective customers and agree on a transaction, all without the seller having to shell out any fee. The app tries to replicate the offline buying experience. The app does not require any email id for registration and a merchant can just register using their mobile number, and list their products thereafter. “The idea is to bring 32 millions of small and medium enterprises online by making it easy for them to list and sell,” said Kunal Bahl, CEO of Snapdeal. “Our goal is to build India’s most powerful digital eco-system .We believe that Shopo is the easiest way to set up a shop online. It takes less than 30 seconds to set up a shop online. We will have a very interesting selection of products on the platform; it’s personalized on a location standpoint” he added. The move from Snapdeal to launch Shopo is also targeted to give competition to Paytm which launched ‘zero commission model’ recently. Other marketplaces like Flipkart and Amazon work on a commission based model.